Most Video Game history books follow a very defined path. Early Computing to SPACEWAR! to Ralph Baer to Atari to Nintendo. Sega, Sony, and all the other hardware players are thrown in there. I picked up Replay on a whim because I couldn’t decide on anything else with my Audible credit, and I was delighted to find it wasn’t of quite the same mold. Sure, the hall of fame players are there, but rather than a focus on the hardware as the framework of the story, Tristan Donovan emphasizes telling stories of the software, both well-known and not-so-well known. Another refreshing take is the Euro-centric portions that take the focus off Japan and the US and give portraits of video game design in England, France, Italy, and others. Most of these stories I’ve never even heard of because they don’t cross paths with Atari or Nintendo, and their games were never released here. I’ve had this book on Kindle for a long time, but the title and cover never stood out enough to catch my interest. It seemed just another history and I’ve already done that many times. It’s a shame, really, because I wish I’d gotten to this book sooner. It’s a joy and I recommend it. An aside, I love the narrator, Gary Furlong. Irish voices are amazing. Kill the turtle. Bullet time. Thanks for the Obvious News Flash, Sherlock. I think the skull laughing at me and the warlock wandering off over there with my axe already gave it away! Flipping Mother oh Jehoshaphat, I’m back in business! My first play through with Ultima was with a female human wizard, and I went in entirely blind. This was a mistake, for this game is brutal and relishes giving you as little information as possible. Very quickly, as I couldn’t figure out how do anything, I downloaded the manual from GOG and read the backstory. Good, now I have idea of what’s happening. However, the manual doesn’t actually tell what any of the keys do, like why, when I hit “T” at what looks like a merchant store to me, does the game keep yelling at me that the King isn’t around to transact with? Or what do I do to get the key from the jester that keeps yelling at me, presumably to unlock the Princess that this monster King is locking up in the dungeon? So I turned to the Internets, and armed with a cheat-sheet of keyboard shortcuts (See Footnote 1), I dove back in. And died. Quickly. After my one trip into Wizardry (You’re a Wizard, Bill), I landed on a fighter for simplicity’s sake. Reading online, I found that you can kill the jester to get the key, but only one key. There’s two cells, and if you get the wrong key the Princess is out of luck and you are going to die a quick death as the guards give you a beat down. But if you succeed, you get several thousand Hit Points, Food, and Gold. SIX TIMES I tried to get the right key. SIX TIMES I got the wrong key. I gave up and just started exploring. Turns out that 3000 HP isn’t that big a deal, and I’d have lost them in the first dungeon. However, another handy way to get HP is to leave the dungeon alive. When you leave you get HP relative in some way to the amount of monsters you fought underground. So, you can go in with 500 HP and leave with 1000 HP if you don’t die. Same with gold, it’s pretty easy to gather as you dungeonate (See Footnote 2). After this I hit a groove. Down into a dungeon, fight until almost dead, hunt for the ladders out, explore to find kings/towns and get better equipment and food. 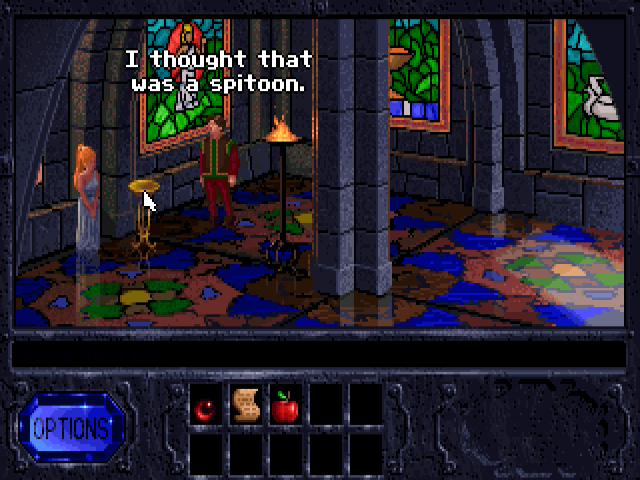 Footnote 1: Okay, Richard Garriott. I get it that you are Lord British, creator of a historically significant RPG series. I get that you were learning how to build computer games as you went. Regardless, this DOES NOT excuse you for using K for “Klimb” or Z for “Ztatistics”. Footnote 2: Difficulty ramps up a lot between Level 2 and 3. Level 2 I’m fightings bats, rats, and skeletons. Hits take 10ish hit points. Level 3 I’m fighting orcs, trolls, and gelatinous cubes and they are taking 50 HP at a time. Be prepared. Good: Ultima is weird. It’s a wonderful mash up of medieval fantasy, time travel, blasters, swords, and more crazy stuff. It’s also stupid in the best way that old pre-Professional Game Design often is. For its age, there’s a surprising amount of things going on. Weapons, mounts, quests, multiple venues, wit and humor. I played about five minutes of Ultima II and the color scheme gave me an instant headache, so I was glad for the remake’s enhanced graphics. The original Ultima I was closer to Akalabeth. Bad: It gets repetitive quickly, and with little actual story meat on the bones, it’s not an easy one to eat more than a few bites. It was fun until it was not. Tids and Bits: As was so often the case in those early gaming days, Richard Garriot was literally learning how to make a computer game during the development of Ultima during his freshman year of college. The original title was Ultimatum, but was shortened to Ultima. Neither word has anything to do with the plot or the world. Having taken a break from most of my hobbies while I worked on a healthy relationship with one of the most important things in my life, food, I’m ready to tackle some more classic games. PROBLEM FOUND! TOO MANY GAMES! I have now spent so long in these caves that I do not remember the light of the sun. 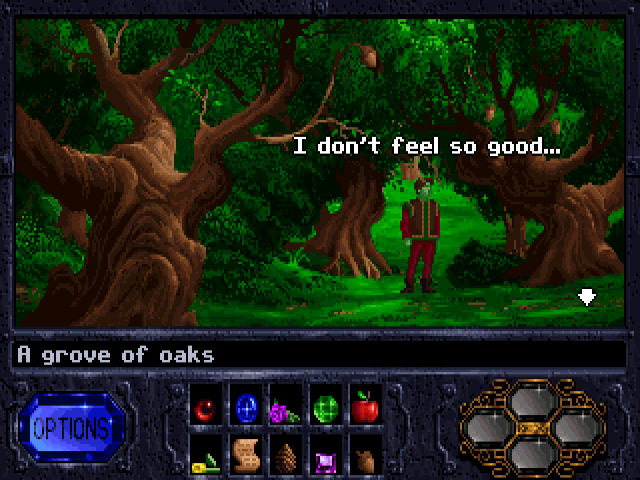 I have eaten 90,210 fireberries. I do not know my name. I do not know which way to go. Make it end. MAKE IT END! Walks into a dark room. 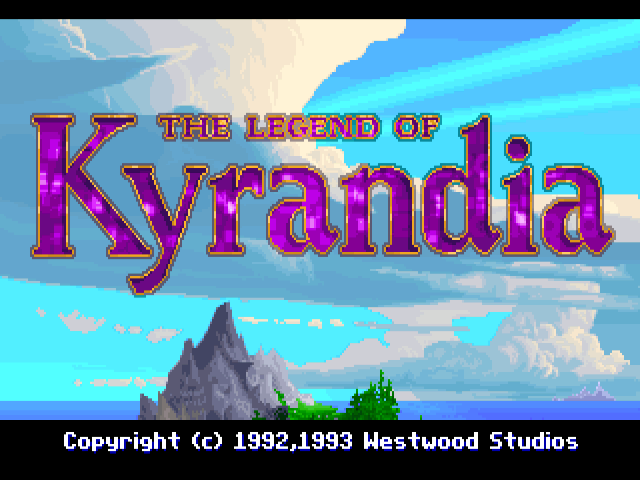 Good: Kyrandia takes a step away from the other point and click adventures of the day and uses a simplified single pointer for all actions. Instead of the usual Eye, Mouth, Hand, Pinky Toe rotation, a single click was used and the context supplied the particulars. I found this worked well in most cases, and liked not having to cycle through cursors. The story, while nothing groundbreaking, is enjoyable. The characters are rote, but still charming. The inventory system allows you to drop items anywhere on the screen, staying there until you come back for them. It’s necessary for the puzzle design, but also feels different than the more linear handling of other titles. Bad: My God, Jim, it’s full of the same Dang Room repeated a million times! The laborynthian nightmare did me in for a true enjoyment of this game. I spent two nights trying to get through the thing before finally resorting to a map from the strategy guide, only to find out that the whole thing was because I’d missed going down a single path to get the last. This was representative of the sometimes insanely obtuseness of the puzzles. I’d recommend keeping a guide handy as you go through this and feel free to look into just what the heck they are wanting from you before you lose your sanity. Tids and Bits: The series was originally called “Fables with Friends” with “The Legend of Kyrandia” being the subtitle for Book 1. In later copies the name fluctuated until they settles on the current title. Westwood Studios was closed by EA in 2003, but until then was more famous for their Command and Conquer RTS games, and before that the Dune (and I think the original) RTS. 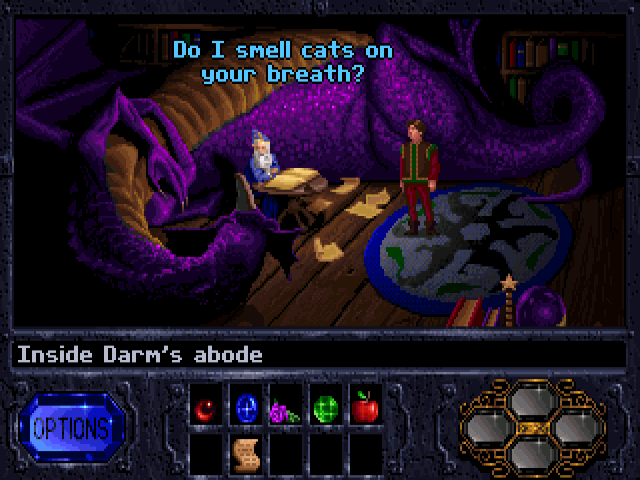 They had quite a string of RPG and Adventure games in the early 90s, including Eye of the Beholder, the Kyrandia titles, and Lands of Lore. Adventurer’s Log, Life 5: It’s been a long day. First I died by running out of food…on my first step. Then I was killed by a rat, a skeleton, and another rat. Now here I am. This orc has brought me what must be a flower of peace. Wait. No, that’s an axe. Now I’m dead again. Stupid line art. Lord British’s first computer game started as a school project for the Apple II. It quickly caught on at a local computer shop, then with a publisher, and made the young Garriot a lot of money. Inspired by D&D and Tolkien, Akalabeth is both one of the earliest RPG games, as well as a word I cannot say or type properly. Ever. Akalababalalabeth is also the precursor of the Ultima series that brought Garriot much more nerd fame and money.